Naked (2010) was a living installation commissioned by the Walker Art Center in Minneapolis. In a gallery setting, both the environment we create and our moving bodies are subject to a much closer gaze by viewers than in a theater. We performed Naked in the Walker’s gallery six hours a day, every day during November 2010. We did not know who would come or when, or how long they would stay, so we did not choreograph durational time with a beginning, middle or end. A few feet away from strangers, we “breathed” time, one moment to the next. During the summer of 2010, as we were preparing the installation, the members of Kronos came to see a work-in-progress rehearsal of Naked. In a small studio scattered with feathers and dirt, we lay down naked. When we uncurled, one by one our eyes met those of Kronos. All of them saw our aged, naked bodies intensely. Their comments helped us realize that Naked had potential beyond a gallery installation. 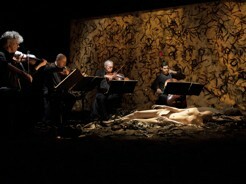 By performing just for Kronos, we learned more about intimacy and nakedness. We realized these are what we had always wanted. We began thinking of Naked not only as a work we were creating for the Walker but as a central theme of our career, which we want to further pursue with Kronos. At the time we planned to work with Kronos’ music for performing Naked. We imagined that performing hundreds of hours in museums would be a good occasion to listen to Kronos. David frequented our studio and sent us many music/sound suggestions from their repertoire, some of which we loved and rehearsed with. However, once we arrived at the Walker, we realized that Naked did not need any music after all. Taped music from carefully placed speakers was extraneous. The “silence” was never silent, and we as well as the audience listened to it intently for hours. This particular collaboration was not about Kronos playing music that would “work,” nor about commissioning a composer to create a piece that would “suit” the concept. 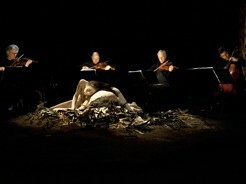 Rather, we desire to be with Kronos just as we are with the black feathers strewn about the set. Kronos would play live for naked Eiko & Koma for four hours in a manner, David says, that is different from anything they have ever done. “Like visiting an old friend in a hospital?” we asked. “Yes,” David said, and suggested Fragile as a title. Kronos will create a variable by choreographing the soundscape. We will be the constant: naked and fragile, no climax, no drama, just an accumulation of naked moments, none more precious than the other. In that, listening might bring us tears and not-listening might bring us dreams. Sophisticated string quartet music might be extraneous to naked bodies, but surely not caring friends who visit our fragile selves. I visited Eiko & Koma at the Park Avenue Armory in New York City to see their piece Naked, which was in development. I was totally unprepared for what I saw. I've never wept at a dance performance before. But there we were together: In a darkened space, their glacial nakedness had become a deeper expression than I remembered, much deeper and somehow more exposed. Their scope of expression had found more revealing forms since I first saw their work, in late 1995 or early 1996. I realized that I was witnessing an absolute center of life, where all layers of protection are removed, where time is irrelevant. Their performance had led me back once again to being a naked infant. The image I was left with was that we are all naked, aging infants in the face of the universe. Eiko & Koma's bodies had become metaphors for the universal, fragile nakedness we try to hide. Their bare skin and awesome, slow movements had become a story of communal privacy. To me this is the precise area where music is most alive. Later Eiko said something that was perfect. She said, in her inimitable light and off-handed way, “Of course we don't really need music for our work.” What greater challenge can be issued to a group of musicians? Kronos is greatly looking forward to exploring together with Eiko & Koma.